Over 30 free DVD, Video, and Movie converter ripping software to download to create MP3, ACC, M4A, AC3, and other audio files and film formats, e.g. VOB, FLV, MPEG, 3GP, MP4, and more. 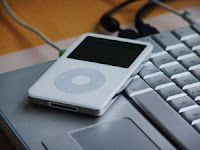 You might want to extract or convert MP3 audio files from a favorite DVD Video, to play music in a home stereo, car stereo, or portable MP3 player or iPod. Below are DVD Movie to MP3 converter software to help achieve conversion, so that you can listen to your music at pleasure. You might need a free MP3 music editing software to split MP3 tracks from a concert or album. Please note, that currently these DVD movie converters are freeware, but may change to shareware, professional versions, or become re branded. So best to search online by their respective software titles to download to try them. Image of iPod Video By abbyyy at SXC. Video MP3 Extractor 1.8 (GeoVid): Simple download movie software to convert AVI, ASF, WMV to MP3. Easy to use interface. AoA Audio Extractor (Version 2): Easily extract MPEG, AVI, WMV, MPG, FLV (Flash Video), MOV, MP4, DAT, 3GP video files to save as MP3, WAV, and AC3 formats. Free Video to Audio converter 2009 3.0.5: Converts from various video formats to various audio formats, including MP3, M4A, WAV, etc. Says it can convert amongst audio formats and supports CD ripping. Your Free DVD Ripper: Simple DVD converter to various supported movie formats, and MP3 and WAV audio. Includes playback and part conversion. Small software file for free download. Freez DVD Ripper 1.5: Currently converts to DivX, Xvid AVI files and other video movie files. Unclear if it converts to MP3. Free DVD MP3 Ripper (Jodix Com): Can choose start and end point to convert from DVD, VCD, SVCD to MP3. Developer states it has a high quality encoder. Free Video MP3 Extractor (Jodix com): Another Jodix software that converts all popular video formats to MP3. Easy to use and has a ID3 tag editor. Cool AVI to MP3 Converter 1.0: Basic AVI to MP3 converter, and supports 64 bit (I think). Free FLV to MP3 Convert 2.0: Easily converts flash video for PSP, iPod, iPhone, etc, and supports batch conversion. VideoSpirit Lite: Easily extract MP3 audio, images, and convert MPEG, AVI, FLV, 3GP, MP4, MOV to other video formats. Requires a codec pack, e.g. K-Lite codec, and includes a few options for quality level, bitrate, and frame rate. Free FLV to AVI MP4 WMV MP3 Converter 2.2: Convert flash video to MP3 and other formats, with part conversions, and optional settings for bit rate, sampling, channels, etc. Free Flash FLV MP3 Converter: Has a built in MP3 splitter to extract/convert a portion of an FLV file to MP3 audio file. Can optionally set the output audio bitrate, frequency, and channels. FLV to MP3 Online Converter (flv2mp3): Try it online to convert up to 100MB FLV 's to MP3's. Tipard DVD to MP3 Converter 3.2.22: DVD ripper to convert to MP3, and has a trim function based on start/end points. Doremisoft AVI to MP3 Converter 1.5: Allows batch conversion of AVI movie format to MP3, with various bitrate, sampling rates, and channel settings. Any Audio Converter Freeware 1.10: Extract MP3/Audio from video formats, and convert between various audio formats. Has batch conversion and inbuilt player, with an attractive interface. Amond DVD Audio Ripper 3.2.2: Converts DVD to MP3, AAC, and WAV format. Says it can shutdown computer after lengthy conversion, easy to use interface, and skin support. Next Free DVD Ripper 2.5.0: Yet another that says it can convert between various video formats and convert to MP3 and other audio formats. Free Video MP3 Converter (FreeStar 1.0.2): Seems to convert various video movie formats to MP3, with the option of 40 bit rates, 3 sampling rates, and 2 channels. Free Speedy 3GP Video Converter 3.6: Easy to use, with batch conversion for various video formats, including to MP3. Free Video to MP3 Converter (2.5): Another software download to extract MP3 from common video formats (3GP, FLV, MPEG, FLV, MOV, ASF, MP4, WMV, etc). Extracts up to 256kbs, i.e. about three quality levels. X2X Free Audio Converter (www.x2xsoft.com): Easy to apply Audio and Video extractor and converter from MP3, WAV, WMA, AAC, and OGG. Video's can be easily converted from AVI, MPEG, MOV, MP4, and others into audio formats at different bit rates. X2X Free Video Trim: Convert a full video, or trim it, to convert to MP3 or MP4. You can play and pause and convert video at the same time. Free 3GP Video Converter: Converts 3GP video movie files recorded with your mobile phone to common PC video formats - e.g AVI , MP4 , MPEG, MOV, WMV, DivX, VOB, etc to 3GP. Also extract and convert MP3 audio from 3GP video files. FormatFactory: A multi function media converter, including images. Supports 60 languages. GermanyX transcoder 5.0.2.866: transcoder/Converter for various audio and video formats, with advanced features: Cue Cutter, WAV/MP3 transformer, play and record audio. Oxelon Media Converter: Supports a range of video formats: 3GP, 3G2, ASF, AVI, DV, DVD MPEG2, FFM, FLV, GIF, MOV, MP4, MPEG1, MPEG2 PS, MPEG2 TS, NUT, PSP, RAW YUV, RM, SVCD MPEG2, SWF, VCD MPEG1, VOB, YUV4, MPEG, M1V, M2V, M4V. Also audio formats: AC3, AAC, AIFF, AMR, AU, FLAC, MMF, MP2, MP3, OGG, VOC, WAV. integrates with windows explorer allowing 3 click conversion, and supports drag and drop. Has dozens of internal codecs. Quick Media Converter 3.5.7 (Cocoon Software): Free converter for a range of video movie formats, and audio including MP3. Has it's own codec library, with a easy and expert mode, with advanced conversions such as cropping bitrate, frequency rates, size, aspect, etc. Video formats include FLV, AVI, XVID, DIVX, 3GP, DVD, H263, H264, MOV, MPEG4, Xbox, PSP, PS3, and more. For audio converts to MP3, WAV, WMA, AMR, and 4MA. Includes batch mode, and has a attractive interface. Internet Video Converter: Supports a large range of video formats to convert to MP3 and WAV. Captures screen shots and can download from YouTube. Kigo Video Converter Free: Supports a variety of movie formats to convert to MP3 and ACC. Supports iPods, iPhones, portable players, and cell phones. Zune Video Converter 1.1: Simple friendly interface, with drag and drop. Converts popular video files (AVI, MPEG, MP4, FLV, MOV, etc) to Zune video format (WMV, MP4, M4V, MOV). Extract audio tracks from video files to MP3, WMA, M4A or AAC format. Can convert full or selected range. Includes optional settings, file size, audio and video bit rates, sampling frequency, resolution, etc. Leawo Free 3GP Converter: Convert popular video formats to others, including MP3, for mobile phones. Leawo Free MP4 Converter: Converter software download for MP4 to MP3, AAC and M4a. Nice attractive interface. Leawo Free FlV Converter: Free Converter Software Download for FLV format to other video formats (AVI, MP4, MPEG, WMV and others) and convert FLV to audio formats: MP3, WAV, AC3, AAC, M4A and others. Free Video Cutter (Technix): Cuts and splits any video to smaller segment and converts to video formats and MP3. Media Coder (Sourceforge Net): Free batch media transcoder to integrate popular audio and video formats into one package. This seems to be an on going project to encompass a range of aspects for audio/video including converting/ripping to MP3. Best to visit the Media Coder site for more information. "Super" 2009 Build 35 (erightsoft): Simplified Universal Player Encoder & Renderer: Supports many formats including video: 3gp/3g2 (Nokia, , Sony, Ericsson, etc) avi, asf, avi (DivX, H263, H263 +, H264, MPEG4, XviD, etc), dat, flc, flv (Flash) , mkv, mpg (Mpeg I, Mpeg II), mov (H263, H263 +, H264, MPEG4 etc) mp4 (H263, H263 +, H264, MPEG4), qt, rm, ram, ogg rmvb, (Play Station), swf (Flash), ts (HDTV), vob, wmv, etc. Just too much! Free Youtube MP3 Converter (FreeStar): Auto detect FLV file URL to download and convert to MP3. Includes batch convert, preview, and optional settings for bit rates, sampling rates, and channels. Free YouTube to MP3 Converter (3.1.5.55): Extract and download, to convert YouTube movies to MP3 audio on your computer. Free Youtube to MP3 Downloader and Converter (4.2.1): Save YouTube video's to MP3 audio files. TubeMaster++: Free down loader and converter software of online video and MP3 content to your computer. You can save or convert to various formats: MP3, MPEG, MP4, PSP, iPod. WinX Video Converter: Extract audio from any video to convert to MP3, but also converts between most video formats: AVI, FLV, VOB, MOV, MPEG 1/2, 3GP, XVID, and others. Includes video functions for enhancement. An associated software is free WinX DVD Ripper, to rip DVD's to a computer hard drive. Noted as also extracting MP3 from a DVD. Altysoft Free Video Converter 2.1: Free powerful and easy to use DVD ripping software download. Can convert DVD to MP3, MP4, VCD, MPEG 1, MPEG 2, 3GP, WMV, and more. It can also download from YouTube and convert to various formats, and convert between the common audio formats. The above DVD Video Movie MP3 converter software downloads are generally stand alone software that indicate easy conversion to MP3. Though I did encounter a limitation in one or two of the software. This is described in my Computer Tech Links Post - How to Extract and Rip MP3 Audio from DVD VOB Movie, where I also touch on using a combination of programs, such as DVD Decrypter and DVD2AVI. You can also use DVD shrink, and "Be Sweet" combination software for MP3 conversions, which I think offer more options, and perhaps are more intuitive. Visit MovieCodec forums and VideoHelp com for DVD Video Movie combination conversions to MP3, and perhaps get a better understanding of DVD to MP3 conversions. Thanks for lots of FREE SOFTWARE. NIce share. http://www.ilikemall.com/how-to/convert-avi-to-mp4-mac.html. it is a great program for converting video.